Sunday, Oct 27, 21:50 - Inhaling deeply, he pressed his inflamed palm against the grubby metallic strip. An automated voice greeted him as the doors slid open, “Welcome, Archie Stanmore, please proceed to priority cubicle 9”. Marshal blinked as the doors opened in front of him. The neon lights seemed brighter than any light he had seen before. He felt a deep nausea. His pale, waxy complexion shone as he staggered, squinting across the threshold. He clutched his stomach, clasping his right hand firmly across his left. Marshal looked sick. Really sick. His heart was racing. He was burning up. As he strained to read the sign in front of him he swayed slightly on his feet. The place was spinning. Marshal knew that things were looking bad. If he survived he would certainly be sent back inside, and this time, he would never be getting out. This wasn’t how it was meant to be. They had told him that everything was sterile. They told him that things would be alright. Marshal took his final step at 21:51. He felt a searing pain in his abdomen as his legs buckled beneath him. As he lay on the cold tiles staring at the ceiling he could see their blurred faces as they leaned over him. For the first time in many years he looked almost angelic as they unfolded his arms, placing them palm upward by his side. As one of them was pumping his chest two others checked over his body, looking for vital clues. It didn't take them long to find what they were looking for. There, on Marshal’s left hand, between his thumb and forefinger was the source of his sepsis; a small angry blemish, the type of which was starting to become an all too familiar sight for the medics who worked in the Emergency Department that Marshal had just stumbled into. Tuesday, Oct 22, 03:48 - The first thing Archie noticed when he woke was the metallic taste of blood in his mouth. The second thing he noticed was a dull pain in the back of his head. His face was cold and wet. As he opened his eyes he could see the familiar flicker of the illuminated sign which stood outside Bank tube station. He was in the street. He was in a side-street. More precisely, he was in the gutter of a side-street. The last thing he could remember was entering the H2O bar with two of his colleagues after work. The rest of the evening was a blur. The pain in his head was tremendous. He must have been hit from behind and as he fell forward his face had taken the brunt of the impact. He summoned his strength intending to raise his hand to the back of his head to asses the damage, but there was a problem. Archie panicked, he was paralysed. He couldn’t move his arms. This couldn't be happening to him. It would take weeks for him to get back on his feet. He couldn’t afford to have that much time off work. Suddenly a surge of serotonin kicked in and Archie rationalised that he could feel his arms; he couldn’t be paralysed after all. Something else was preventing him from moving them. His hands were tied. They were tied behind his back. Archie struggled, trying desperately to release himself as he called for help. He could feel the pain in his hand now. Even in his dazed state he knew what had happened. The same thing had happened to one of his contacts on another trading floor just a few weeks earlier. 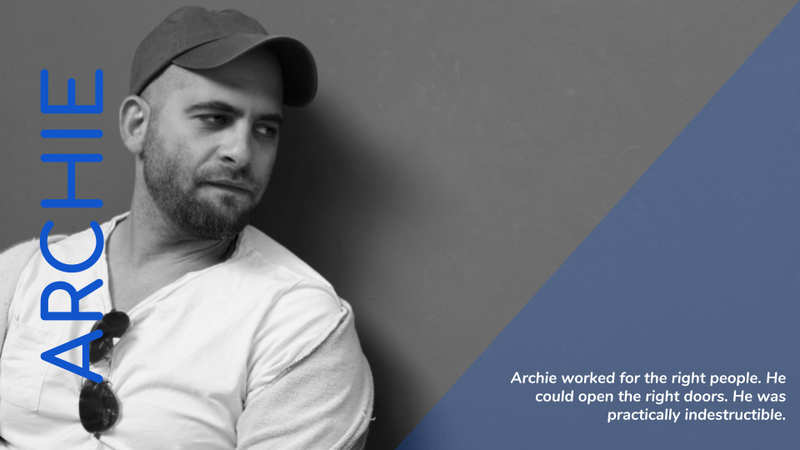 Now Archie had been targeted, and for the short term at least, he had lost everything. Tuesday, Oct 22, 09:33 - Marshal stepped cautiously through a grubby looking door at the back of the shop. “Hello”, he called as he progressed slowly along the corridor. He felt uneasy. Surly this couldn’t be the place. He had expected something a little more clinical. He had handed over everything he had managed to scrape together for this; it was his last chance. He needed the treatment or it was game over for him. Marshal’s immune system was finally shutting down. The virus was getting too strong. He knew that with his history of health limiting activity there was no way he would ever be eligible for the medical insurance he needed to get his hands on the ‘miracle’ cure, even if he could have afforded to look into it in the first place; his imbibed toxins data would put pay to that on their own. It was so unequitable. When Marshal’s grandfather was born, treatment was still free-for-all at the point of delivery, now 100 years on everything had changed. Nothing was free, there was a sliding scale. Health was insured and everyone was trading off. Well, almost everyone. If you worked for the right people, like those big companies in the City who paid higher health premiums for their employees, you had access to a whole different level of treatment. With the drugs and treatments developed over the past couple of decades almost everything had become curable; those lucky few were practically indestructible. Marshal stopped. Another door was open. This was the place after all. “Come in”, said a voice. This must be the person they had told him about. At the back of the room was a reclining chair with an old metal medical cabinet positioned next to it. As Marshal approached he could see a small kidney dish. He pinched the skin on his left hand between his thumb and his forefinger. He could feel his Grain through the tissue. As he peered into the kidney dish he could see an object of roughly the same size and shape lying in the bottom. The object was in fact identical in every way, every way except for one. The data stored on the Grain in the kidney dish was cleaner than Marshal’s. The biological data reflected that of a clean living athlete, the bank accounts it could access contained money, the doors it could open were more up-market, and the insurance credentials it contained were for the higher health premium. This was a genuine grade-A Grain. Marshal looked around the shabby storeroom with it’s dirty walls and flickering lights. He really had hoped for more, but then again, that was the story of his life. Marshal turned nervously to look back at the door he had just walked through, as if he was a man with a choice. The door shut and Marshal nervously took his seat.